I thought I would start with these two images. They show my fascination with junk and treasures. The first piece called "Looking for the Path" is a planter holder which I made a cover for the back with fabric. 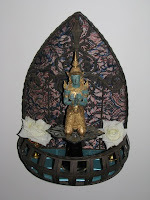 I then chose the figurine from my collection and made the floor from some salvaged glass tiles and the base from a clarinet horn and decorative metal piece. She needed an altar I felt. The flowers have fake water drops which look very realistic and add a bit of drama to the piece. I named it "Looking for the Path" as she seems in a very contemplative pose with some deep thoughts/questions going on. The second piece is called "My Beaten Heart". The back is a old wood pattern that would have been used for the mold for copper washers. 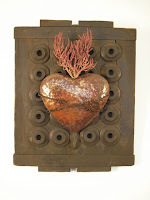 I hand beat the copper heart and added barbed wire and dried coral (I found the coral dried on the beach in Mexico). It is a sacred heart to me and could hold many secrets. (sacred hearts were sealed silver hearts which had a personal message which nuns carried under their habits). I encourage dialogue about my work so please forward any questions or suggestions you may have. I love this introduction. I really enjoy the explanations of your works and what they mean to you. I look forward to more. My world pretty much revolves around my kids these days, and my eldest son Charley still mentions your work even with 6 months between the last time he saw it on display.